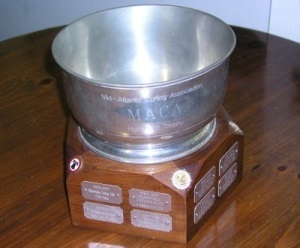 The intent of the MACA is to promote curling and camaraderie among the various clubs, and to give curlers the opportunity to travel and play at other clubs in a friendly environment. Each MACA is a one day event consisting of two six-end games. Multiple draws are usually held to accommodate the 32 curlers (eight per club). In addition to the unusual number of ends, each curler rotates through all four rink positions, lead, second, vice, and skip. That’ll take a bit of explanation. Suppose your first position, frequently drawn out of a hat, is lead. You will play two ends as lead, then two ends as second, and then one end at vice (3rd) and one final end as skip. That’s the end of the first game. The second game starts you out at vice again, and you play two ends as vice, two ends as skip, then one end each as lead and second. As you can see everybody plays every position for three ends, regardless of the individuals experience or skill level. It’s part of MACA and a good learning experience in a non stressful environment. It’s a very friendly competition, and it’s quite common to see an experienced skip on one rink coaching a new competing skip on the same sheet of ice! Do we keep score? Of course! There is a long convoluted scoring process that rewards clubs with points for the number of curlers attending, points scored in each end, the number of ends won, and of course the number of games won. View an example score sheet here.